A communicative tool that translates words or phrases into one-of-a-kind digital works of art. Rune is a communicative tool that translates each letter of the English alphabet into a graphic form, producing a unique composition for every word or phrase. The tool allows users to interact with the system and translate their own words into this new language. Rune also enables the creation non-objective works of art that are not formed by language, but instead drive the language by the forms that are created. The title of each composition is created by the keys pressed by the user. Some titles may seem deliberate, while others nonsensical. The goal of Rune is to allow users to experiment with form and language, and to see how one can change the meaning of the other. The idea emerged after reading a chapter titled “La Mer” in Nicholson Baker’s The Way The World Works. The chapter synthesized the author’s experience listening to the Debussy orchestral composition, and being fascinated by the way the composer captures the essence of the ocean in song. Inspired by Debussy’s translation of one medium to another, Rune was created to translate language to image. Upon release, Rune was displayed in a multidisciplinary design exhibition. The audience was free to experiment with the program and create their own compositions. 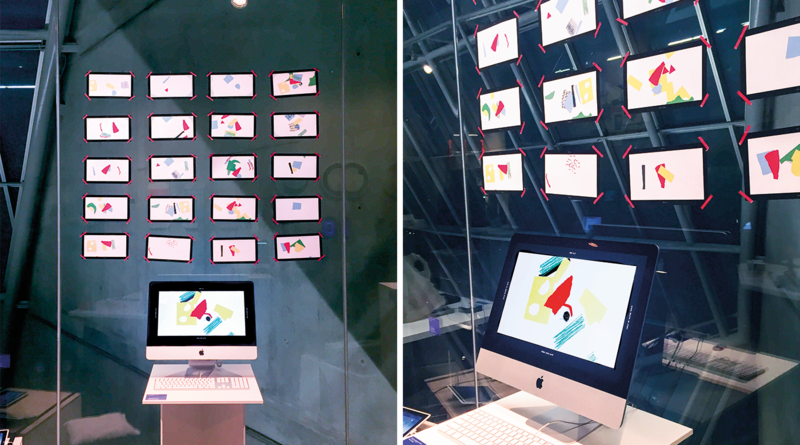 Each saved composition was then printed and displayed, resulting in a collection of user-generated art and dialogue.